The impact of measurements made at HERA, present and future, on the physics of the LHC is potentially large. However, this potential is currently not as well explored as e.g. the more obvious connection between the Tevatron and the LHC. The most obvious area of impact is in the determination of proton structure from very low to very high x, which is measured precisely at HERA. Others topics include QCD production of heavy flavors and the study of multi-jet final states, energy flows and structure of underlying events. A unique feature of HERA is the photon, which, depending upon its virtuality, can be hadronic or point-like, enabling to effectively turn on and off the internal structure of one of the beam particles. Finally, the area of diffractive and forward physics, where HERA data have made a large impact in the last decade, is of growing interest to LHC experimentalists as a window on high density and low x QCD and as a search channel for new physics. To identify and prioritize those measurements to be made at HERA which have an impact on the physics reach of the LHC. To encourage and stimulate transfer of knowledge between the HERA and LHC communities and establish an ongoing interaction. To encourage and stimulate theory and phenomenological efforts related to the above goals. To examine and improve theoretical and experimental tools related to the above goals. To increase the quantitative understanding of the implication of HERA measurements on LHC physics. production cross sections, fragmentation, charm and beauty in the proton distributions. 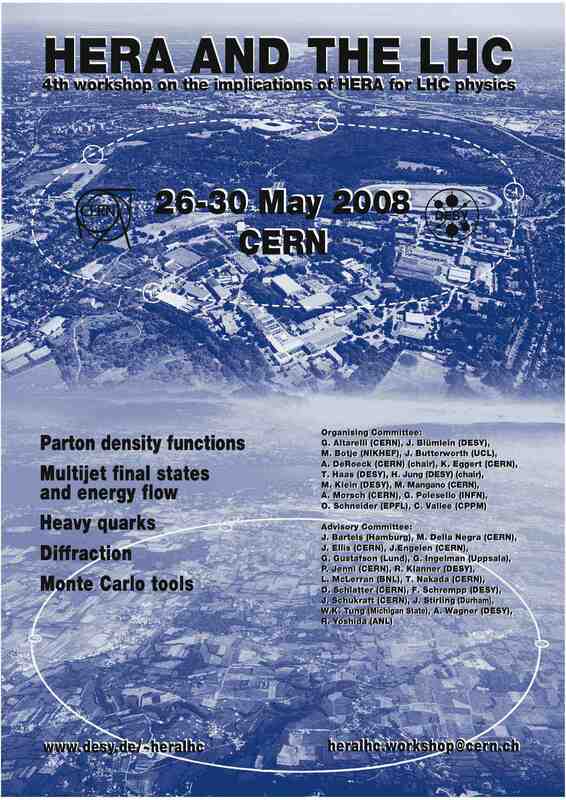 The HERA - LHC workshops will be held yearly, the working group week meeting in 2007 is at DESY, the meeting 2008 is at CERN. We will have proceedings after the 2008 meeting, with a summary report from each working group and individual contributions. The proceedings will be printed and published electronically.